The river Isis flows toward us as Duckworth and I row close to the riverbank to avoid the current, making our way upstream. Our destination? A particular meadow with some ancient beech trees, for a picnic. Thalia sits in the bow, glowing, equipped with a parasol to protect her and the picnic basket from the summer sun. “Are you familiar with The Riddle?” I ask Duckworth as we labor. “Thalia and I read it last night.” I tell him the bones of the story to pass the time as we rhythmically dip our oars in the water. A prince and his servant take shelter one night in the house of a witch. In the morning, as they saddle up to leave, the witch offers them a parting drink. Warned against her evil nature, the prince departs, but the servant is not as quick. The drink offered is so foul with poison the glass shatters, spilling onto the servant’s horse, killing it instantly. The servant runs off to the prince to tell him what happened, and they return for the saddle and bridle. A raven has already begun to eat the horse. The servant kills the raven to serve as their evening meal. The end of the day finds them in a den of thieves, who plan to kill and rob the travelers, but not until the would-be culprits have had their supper, which includes the purloined raven. Unbeknownst to everyone, the raven is infected with the poison that killed the horse. The twelve robbers meet their sorry end. Knowing she has met her match, that evening she sends her maid, then her chambermaid, then goes herself, to see if she can get the prince to talk in his sleep. In each case the women escape, slipping out of their robes to do so. However, the princess escapes with the answer. The next morning she declares she knows the answer, but the prince proves he gave her the answer by producing the three robes snatched from her and her servants in his bedchamber. The princess’ robe is taken, and embroidered with gold and silver to serve as her wedding mantle. “Quite right.” I ported my oars as we reached the meadow. I’ll have to think about that one awhile. If I ran across a fairy tale without a variant, I’d doubt its credentials. As yet, that has not happened. For The Riddle I know of two. I find these variants particularly interesting. Neither of them ends where The Riddle ends. They go on to more adventure, or to make a point. In The Ridere of Riddles, the Scottish form of the story, the travelers are half-brother princes fleeing the mother of the youngest, she trying to poison the eldest son. 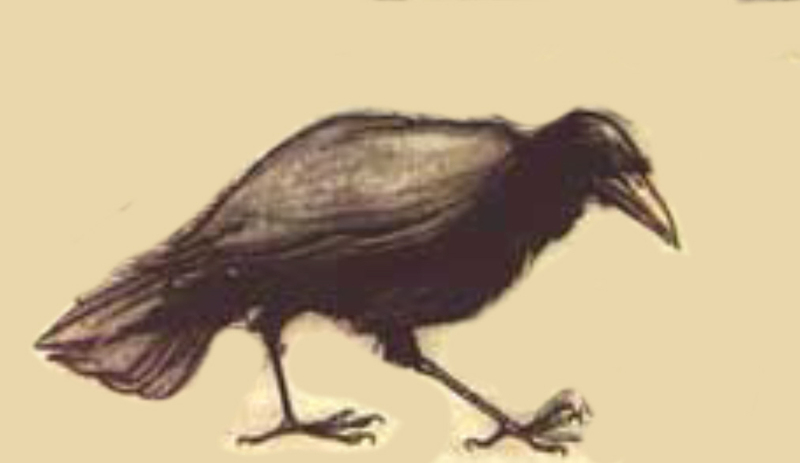 The numbers are different: two poisoned horses, twelve dead ravens, twenty-four robbers eat poison raven pie, and the riddle is consequently longer. Twelve maidens try to seduce the answer out of the brothers, but are themselves seduced by the younger. 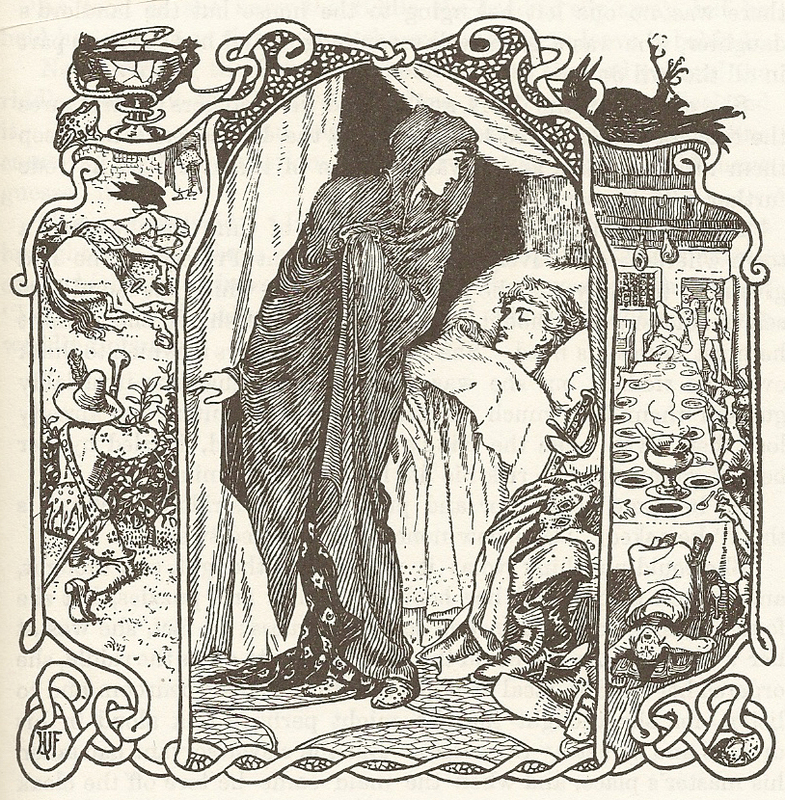 The second variant, my favorite of the two, is The Boy in White Silk, a Danish tale. The protagonist, a simple farm boy named Hans, sets out on his life journey. In his first act, he pays the unsettled debts of a deceased man, allowing the corpse a decent burial. Immediately afterward, a boy dressed in white silk joins him, leading Hans into bizarre adventures with a dead horse, dead ravens, and dead robbers to the poor farm boy’s increasing distress. Nonetheless, they agree to share their fortune equally. Further adventures lengthen the riddle even beyond the Scottish version. By a similar process as in the other stories, Hans marries the princess and gets half the kingdom. The boy in white silk shares in the good fortune. One day the boy decides to go away and wants his half of the fortune, which includes half of Hans’ five offspring. Five being an odd number, the boy cuts one of the children in half. Hans is in despair. The boy relents and puts the child back together, returning it to life. Hans is ecstatic. The boy in white silk reveals himself to be an angel sent to reward Hans for paying the corpse’s debt. As despairing as Hans was, so was the corpse. As happy as Hans now is, so is the corpse for having a proper burial. The angel disappears, never to be seen again. 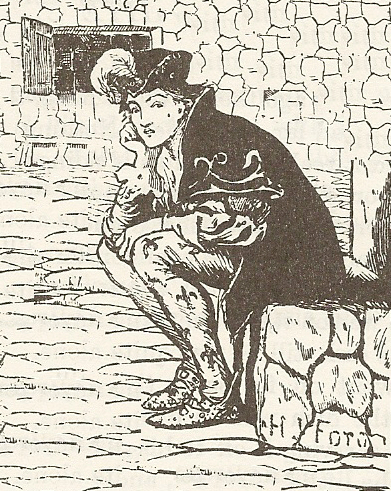 The Riddle was included in the Grimms’ second edition of Kinder- und Hausmärchen in 1819. John Francis Campbell published The Ridere of Riddles, collected from a fisherman near Inverary in 1859, in his Popular Tales of the West Highlands. The Boy in White Silk, collected by Evald Tang Kristensen, appeared in the volumes he issued between 1881 and 1887. The dates suggest that the Grimm version is the earliest, and the later versions, with their accretions, were developed by later storytellers. The Ridere of Riddles added to the end of the story; The Boy in White Silk to the beginning, the middle and the end. These expanding stories—living, growing entities—evolved. Being put into a fixed form, as the Grimms did when they published The Riddle, does not halt their evolution. Stories will continue to grow as long as storytellers (of all kinds) keep tinkering with the tales. Without their help, there would be no variants, no other versions. P.S. An English translation of The Boy in White Silk will soon be available in e-book format, entitled Odds and Sods – Stories Taken from the Collections of Evald Tang Kristensen, by Stephen Badman. Other Danish tale collections already available from Stephen are Tales from Denmark, More Tales from Denmark, The Ghost on Horseback, Three Pieces of Good Advice, and The Soldier and Mr Scratch. The almost suffocating aromas of rich tobacco, emitted from their canisters in Augustus’ shop, welcome me, along with the tinkle of the bell above the door. “No.” That signals our retreat to the back of the shop to sit in his comfy chairs and test a bowl of Raven Black. “I’’ve read and been contemplating The Riddle,” I confess, by way of explanation. “The difference being…?” I query. “There are two types of riddles: enigmas and conundra. To solve an enigma requires careful thinking, the putting aside of assumptions, and some ingenuity. I groan slightly as I remember that one. I think about this as the Raven Black makes my head swirl. For a moment I spy ravens fluttering up around me. P.S. I won’t leave you hanging. Enigmas 1: Nothing 2: Short 3: Silence. Conundra 1: A newspaper (red/read) 2: Palm tree 3: Spoiled milk (sorry).